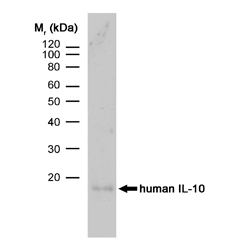 Rat anti Human Interleukin-10 antibody, clone JES3-9D7 recognizes human Interleukin - 10 (IL-10). IL-10 is an immunoregulatory cytokine which is expressed by activated CD8+ve peripheral blood T-cells, CD4+ve T-cell clones, B cell lymphomas, activated monocytes and mast cells. Rat anti Human Interleukin-10 antibody, clone JES3-9D7 is reported to act as a neutralising antibody (Othieno et al. 1999). 1 Membrane permeabilisation is required for this application. Bio-Rad recommend the use of Leucoperm™ (Product Code BUF09) for this purpose. Othieno, C. et al. (1999) Interaction of Mycobacterium tuberculosis-induced transforming growth factor beta1 and interleukin-10. Infect Immun. 67 (11): 5730-5. Cua, D.J. et al. (1999) Transgenic interleukin 10 prevents induction of experimental autoimmune encephalomyelitis. J Exp Med. 189: 1005-10. Lindmark, E. & Siegbahn, A. (2002) Tissue factor regulation and cytokine expression in monocyte-endothelial cell co-cultures: effects of a statin, an ACE-inhibitor and a low-molecular-weight heparin. Thromb Res. 108 (1): 77-84.